M+B is proud to present an exhibition of color photographs by ANDREW BUSH titled VECTOR PORTRAITS, opening on September 12 and running through October 15, with a reception and book signing by the artist on Saturday, September 12 from 7 – 9pm. Vector Portraits is Andrew Bush’s series from 1989 to 1997, shot in and around Los Angeles using his car as a tripod and capturing Angelenos vis-à-vis their unique relationships with their automobiles. Los Angeles, described as “72 suburbs in search of a city,” is known for its miles of freeways, surface streets and legendary traffic. Because of that time spent in cars there is an ambiguous space, neither public nor private, that is conjured up in these air-conditioned living rooms on wheels. Bush describes this twilight space of driving as the amalgamation of “the maneuvering and direction and the speed . . . [making one] feel they are untouchable, in control of their destiny, in a private world of their own”. In this series, Bush captures a cross section of the city in this illusory state. The series began in 1989 after Bush graduated from Yale with an MFA in Photography and moved to Los Angeles. 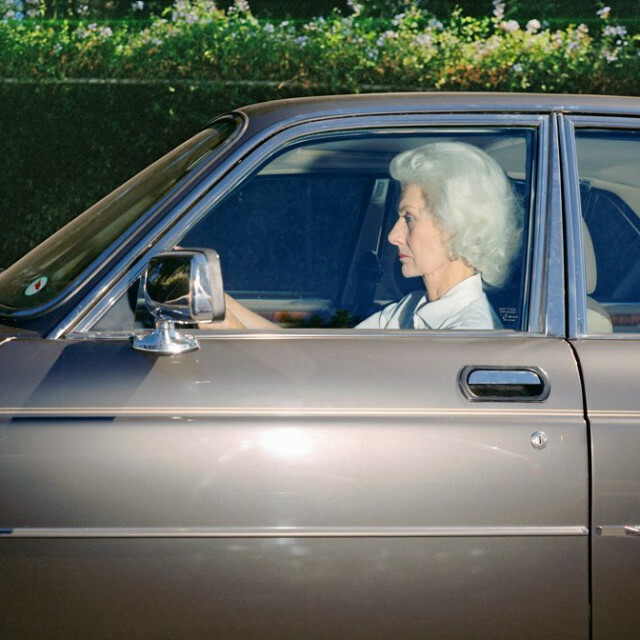 Struck by the city’s “great relationship between people and their car”, Bush attached a medium format camera to his passenger seat with a strobe light and a shutter release cable and drove the city streets and freeways. Either stopped in traffic or moving at speeds of 20 to 70 miles an hour, Bush’s method included “moving in parallel with the person next to [him], as a way of coming into their world” and then releasing the shutter. The photographs have a uniform set up: the subjects are always the same distance and scale in each image and represent a cross section of the American public. Some of them display car pride, and others do not. Some are alone and very much in their own world, while some drivers are interacting with their fellow passengers. Likewise, the vehicle captured is every bit a part of the portrait as its driver. The essence of what makes these appealing images is that they are a prolonged version of the awkward eye contact frequently made while driving. It is undeniably voyeuristic and satisfying, and now one has the leisure to examine minutely while remaining anonymous. Bush offers up a slice of Los Angeles life at its most mundane and telling. Andrew Bush graduated from Yale University with an MFA in Photography in 1982 and has been pursuing the Vector Portraits series since he moved to Los Angeles in 1989. The work has been exhibited extensively in solo and group shows, including The Metropolitan Museum of Art (New York), Walker Art Center (Minneapolis), Davis Museum and Cultural Center at Wellesley College (Wellesley, Massachusetts) and Staatliche Kunsthalle (Baden-Baden, Germany). Bush’s work is held in prominent public collections such as the Whitney Museum of American Art (New York), Art Institute of Chicago (Chicago), The Metropolitan Museum of Art (New York), The Museum of Modern Art (New York), The Museum of Fine Arts (Houston), The San Francisco Museum of Modern Art, The George Eastman House (Rochester, New York) and The Victoria & Albert Museum (London). The artist currently resides in Los Angeles. In 2008, Yale University Press published his monograph Drive, which includes an interview by Jeff L. Rosenheim, a curator of photography at the Metropolitan Museum of Art in New York. This will be Bush’s first exhibition with M+B.